Meet the trailblazers changing the face of the beauty and wellbeing business. The health and beauty industry is booming, but wellbeing today is so much more than just a lucrative business: it’s a way of life for millions of people around the world. In the UK alone, the market is worth £24billion and growing by 10% year on year. This is a worldwide trend: 2016 saw more health and beauty shops opening in western Europe than any other retailer. 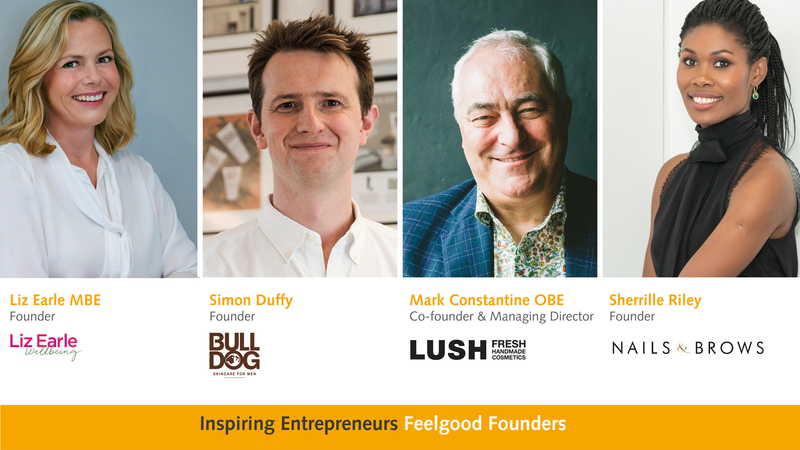 Hear from the founders behind some of the best-known health and beauty brands to hear about their business journey and the values behind their brands. You will have the opportunity to ask our expert panel your burning questions via Twitter. Liz Earle MBE, wellbeing entrepreneur and co-founder of Liz Earle Beauty Co.: a global brand pioneer, Liz co-founded (but is no longer connected to) the Liz Earle Beauty Co., moving on to launch Liz Earle Wellbeing. She is the Founder and Editor-in-Chief of Liz Earle Wellbeing magazine (published internationally by Hearst), founder of Liz Earle Fair and Fine, an award-winning range Fairtrade gold botanical jewellery and hosts the popular Wellness with Liz Earle weekly podcast. Mark Constantine OBE, Co-founder and Managing Director of Lush: British High Street beauty retailer Lush Fresh Handmade Cosmetics is the ultimate beauty delicatessen and, since establishing 22 years ago, has been driven by both innovation and ethics, which include combatting over-packaging and a comprehensive commitment to ethical buying. Mark Constantine founded the company in 1995 with five co-founders including his wife Mo, and is the driving force behind the business, working as part of the product development team creating hair, skincare and body creams and spa treatments. It is Mark’s beliefs and morals that Lush is based on, and that have become the backbone of the company. Simon Duffy, founder of Bulldog Skincare for Men: Bulldog makes male skincare, beard and shaving products. The idea for Bulldog was born in 2005 when Simon noticed that there were no straightforward skincare options for men. Bulldog launched in the UK in 2007, started to export in 2010, and today can be found in 25 countries. Bulldog products use amazing natural ingredients, are certified by Cruelty Free International, and are suitable for vegetarians and vegans. Sherrille Riley, Founder/Director of Nails & Brows Beauty Mayfair Boutique: as a beauty therapist with more than 20 years’ experience of working in high end beauty spas under her belt, Sherille realised that there was a gap in the market for a quality haven for women to tend to these very important beauty treatments. She decided to merge the two industries and in 2014 launched Nails and Brows in exclusive Mayfair. Royalty and celebrities are frequent visitors, Prince Harry’s significant other Meghan Markle and Princess Beatrice to name a few.